I was born in the year 1980, or 3 A.S.W. Otherwise know as, 3 years after Star Wars. The film series spawned a merchandising empire that is so large and ingrained into our society and consciousness, that it’s almost hard to imagine a time before we knew about Landspeeders, Star Destroyers, or even The Force. Looking back on it, I can only imagine what it must have been like to be a young child in 1977, and seeing Star Wars for the first time. Think of it, watching Obi-Wan Kenobi pull out that metal cylinder from his storage bin, telling Luke that it was his Father’s Lightsaber, before suddenly, like magic, a glowing blue blade appeared attached to it! Years after seeing the film, I wanted a Lightsaber of my own. I remember begging my parents for one of the original plastic ones in the early 80’s. Though it wasn’t until 1995 when the resurgence of Star Wars merchandise began, that I did get a plastic lightsaber. I ended up getting Luke’s from Return of the Jedi, and 5-6 years later, I would add Darth Maul’s double-bladed saber and Obi-Wan’s from the prequel trilogy to my collection. But like many, I dreamed to hold the real thing, and imagine that at any moment, the flick of a switch would ignite a glowing pillar of light that could slice through almost anything. 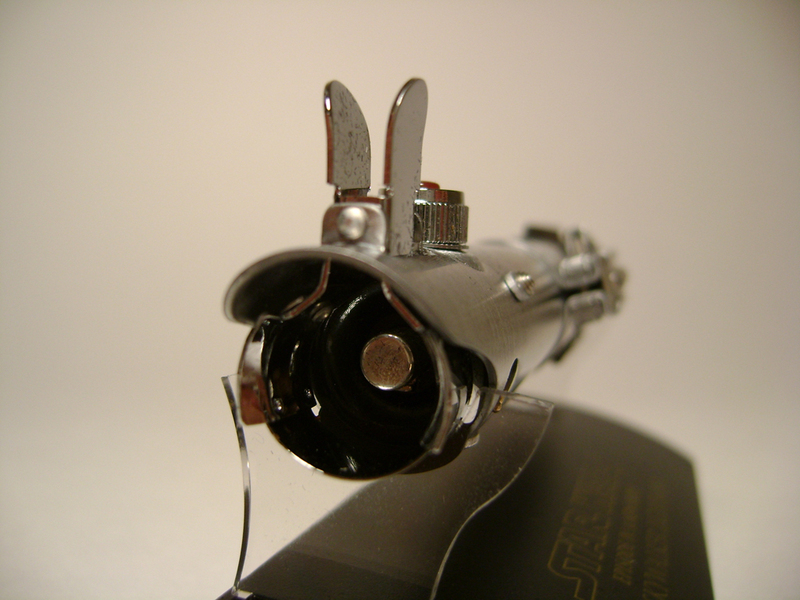 In 2003, that wish (almost) became a reality, when the company Master Replicas (nicknamed MR) obtained the license and permission from Lucasfilm, Ltd, to make replicas of various items from the Star Wars series. 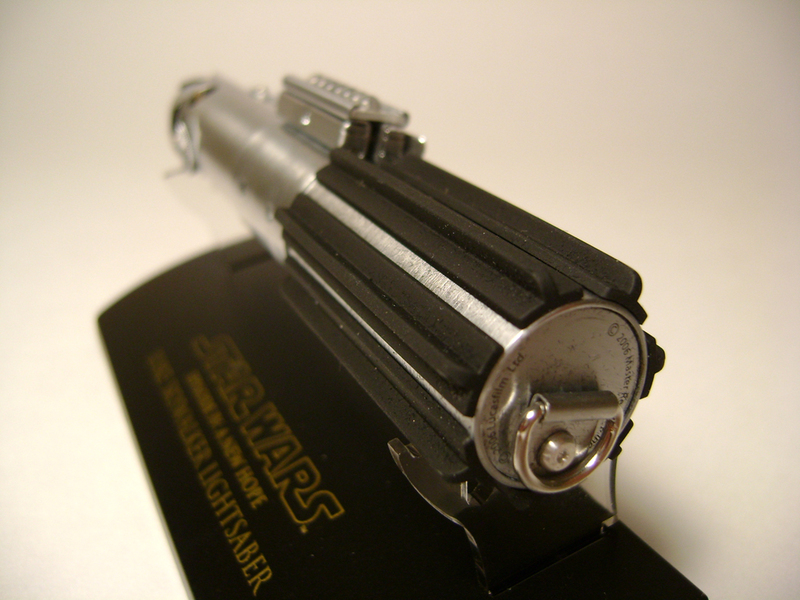 During their time with the license, they manufactured numerous lightsaber hilts, as well as replicas of various blasters and guns from the series as well. This new approach was to machine/create replicas in a scale that was 45% the size of the original item. 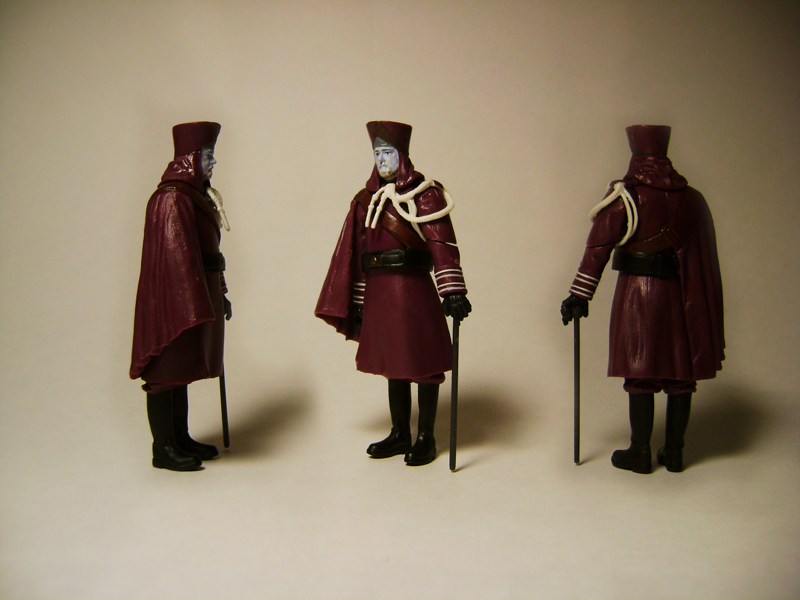 This also made them more easily obtainable, as these scaled replicas fell into the $35-$65 price range. Through several different sources, I managed to obtain three of the .45-scaled lightsabers that to me, have great significance to the series – those belonging to Luke Skywalker, Darth Vader, and Obi-Wan Kenobi from Episode IV: A New Hope. These three introduced us to lost weaponry in that galaxy far, far away, intriguing our minds as to what the former Jedi and The Clone Wars were really about (that is, until we finally found out…but that’s another story). Once Luke ignited his father’s lightsaber, it also ignited in us a curiosity regarding the days of the Old Republic. 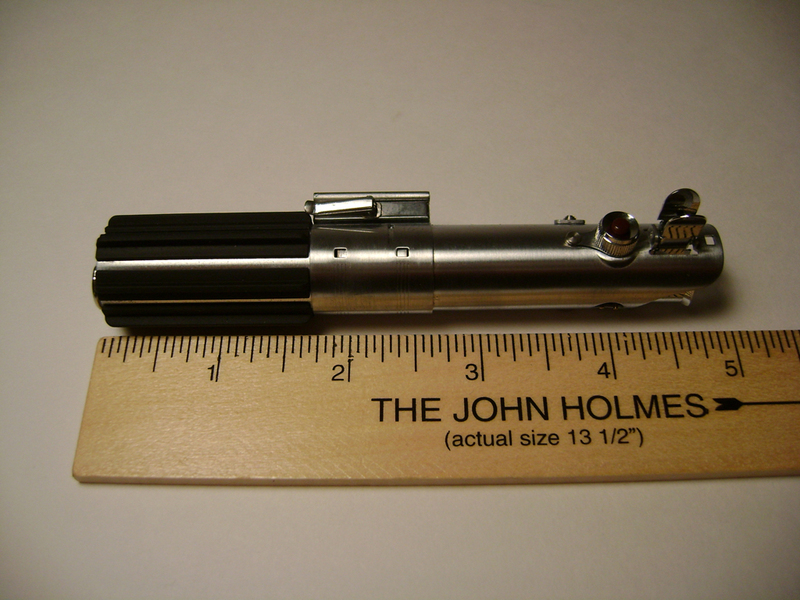 After all, the mind boggled imagining over 1,000 generation of Jedi handling sabers similar to this one. Luke (and the audience) discover the ancient weapon of the Jedi. We never did get a major close-up of Luke’s lightsaber, but we did see him wield it in action twice: upon it being given to him by Obi-Wan Kenobi, and then in the Millennium Falcon, as Luke tests his mettle against a training droid. 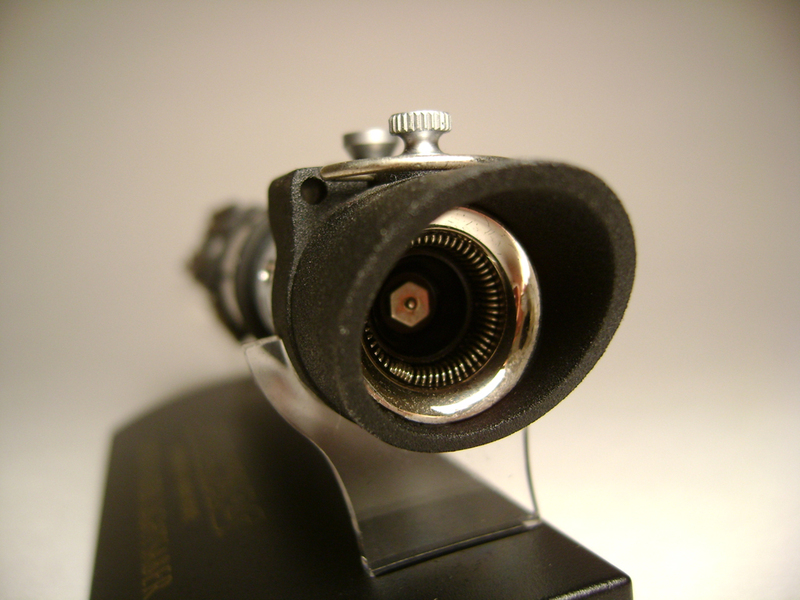 We would caution you not to look into the blade ignition shaft of a lightsaber. Even so, we bet you didn’t know it looked like this. Master Replicas‘ work on recreating the saber in .45-scale is quite amazing. 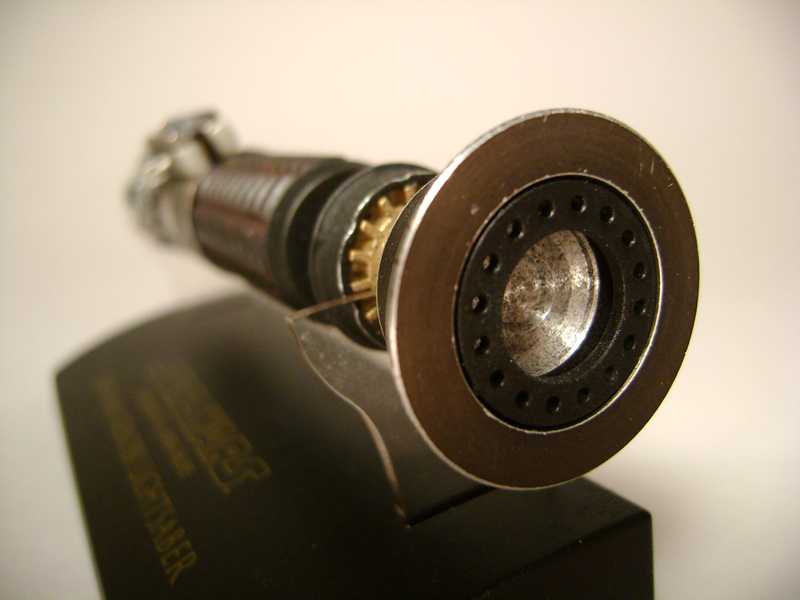 The original lightsaber was not machined on its own, but the shaft is actually a re-purposed Graflex flashgun that held flashbulbs for vintage cameras. The prop department then added various pieces, along with the black-ribbed handle/base. A rare detail that was lost in earlier and later episodes of the Star Wars. 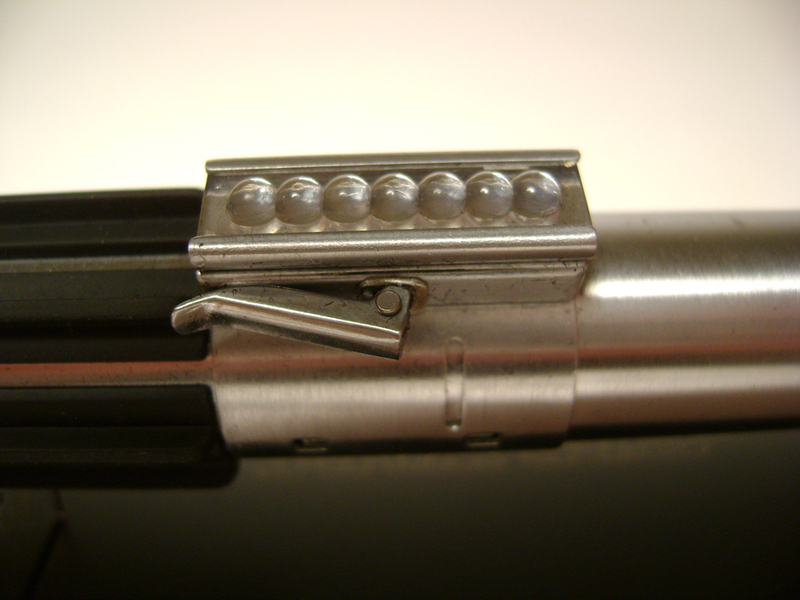 A New Hope would also be the only time that lightsabers would have these 7 beads embedded in the switch, which is actually a piece manufactured by Texas Instruments. The lightsabers used in The Empire Strikes Back and Revenge of the Sith instead have a gold-plated, grooved cover. The lower-grip on the lightsaber, is actually several! Probably just referencing my action figures, I had often assumed the handle was one black piece. In actuality, it’s several windshield wiper pieces ringed around the base. At the bottom, we also see this replica stray a bit from the actual prop, with the copyright information, and the screw. 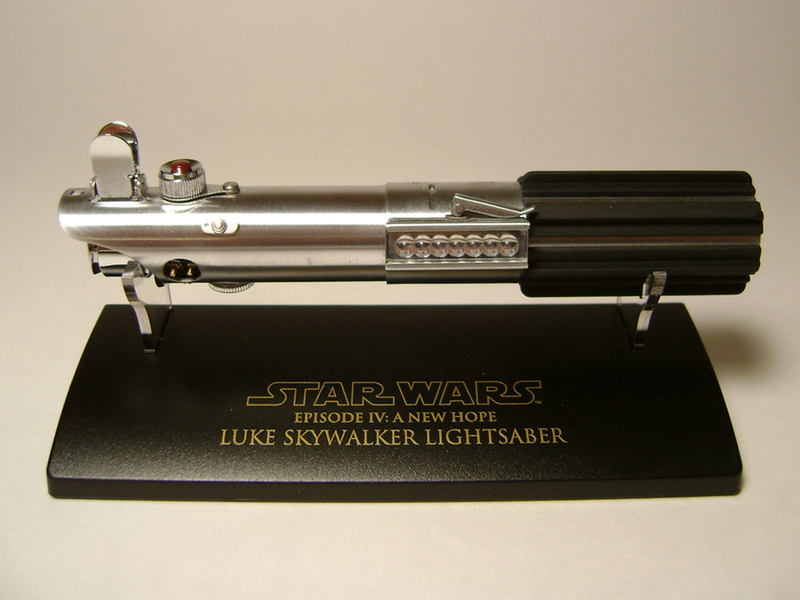 The .45-scale of lightsaber was distributed for 3 years (from 2004-2006), and Luke’s A New Hope lightsaber was one of the last offerings. Obi-Wan prepares to meet his former apprentice. Unlike Luke’s lightsaber that had been well-preserved, Obi-Wan’s has actually aged along with its Master. Most likely, Obi-Wan used it whenever he could, but it also appears that he may have banged it around on some of the rocky cliffs near his home on Tatooine. 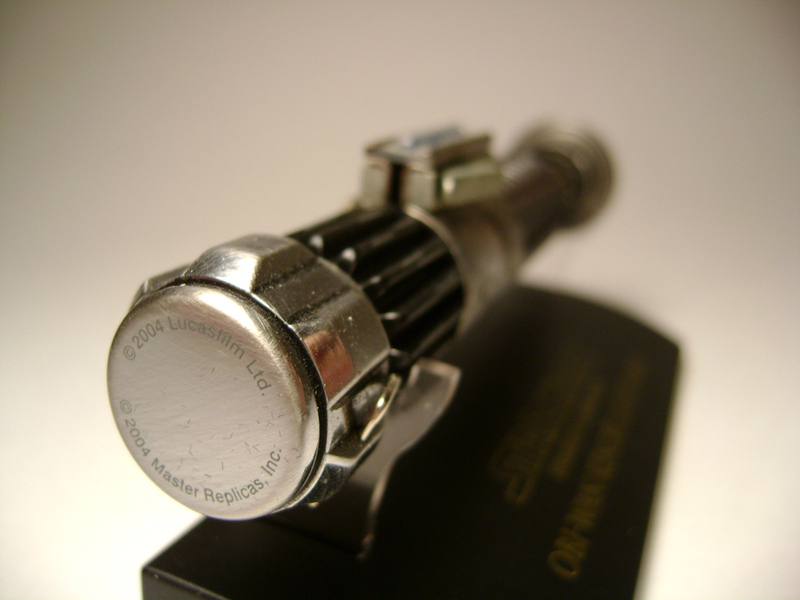 More detail of Obi-Wan’s lightsaber that you’ve probably never considered. 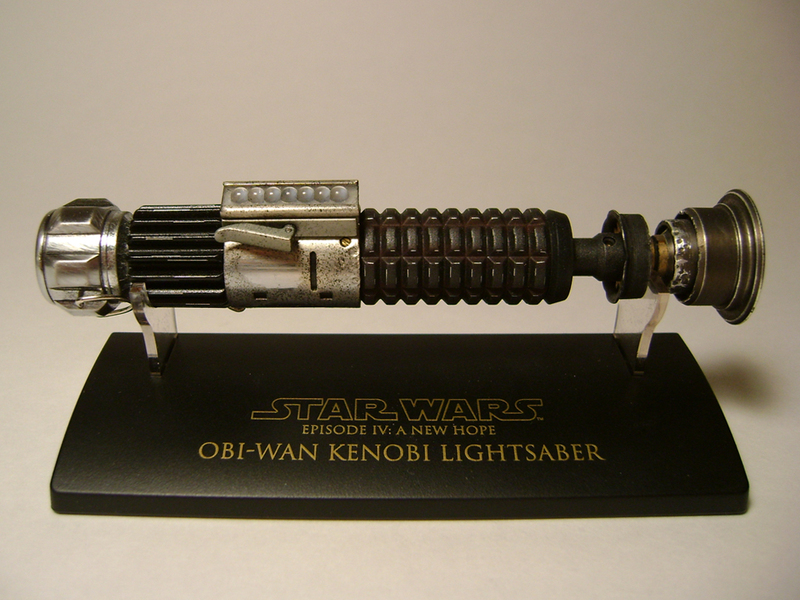 In 2004, Master Replicas released two separate renditions of Obi-Wan’s lightsaber as convention exclusives. The first iteration was called ‘first-built,’ and showed us what the lightsaber would have looked like ‘a long time ago.’ Later on that year, a ‘weathered’ edition came out, looking more like the prop that Sir Alec Guinness carried on set. The detail job isn’t just scratches and flecked paint. Just look at the dents above in the mid-rimmed section! It seems like they cheated a little with the rather uniform ‘weathering’ on the raised edges above, but it’s small potatoes when you look at the detail work on the metal portion, with the grime and dirt, not to mention that shiny patch worn in, where we can assume Kenobi positioned his thumb on the hilt. Probably the cleanest portion of the lightsaber. Unlike Luke’s lightsaber, Obi-Wan’s in the film is cobbled together from seven different parts. For example, the ribbed portion in the picture above is part of a Browning ANM2 machine gun booster, and the lower metal cap is actually an Armitage Shanks Starlite model Handwheel. After Master Replicas had exhausted their supply of the weathered Obi-wan lightsabers, the secondary market value doubled for quite awhile. Luckily, I was able to obtain mine for the original value when it was released. 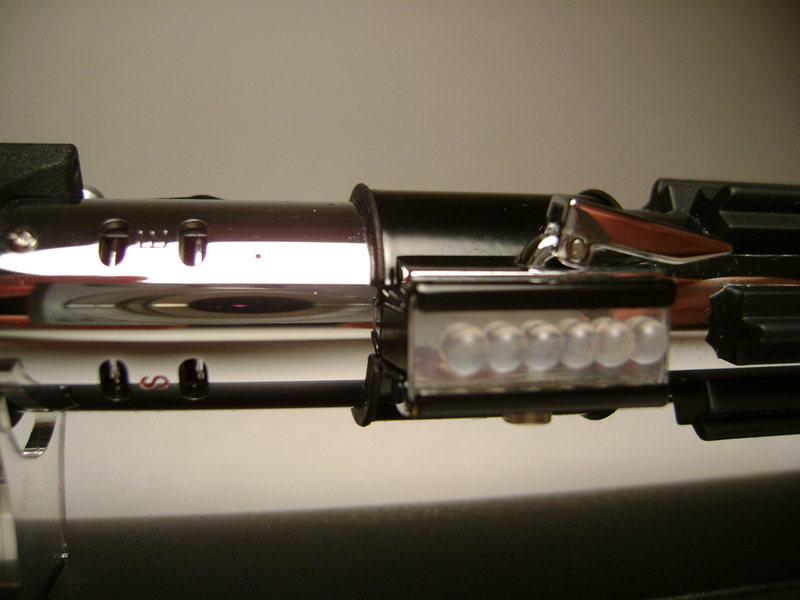 Of the three .45-scale lightsabers I have, I love it for the detail and ‘history’ behind it. Speaking of 3 lightsabers, we have one more to cover. Though Luke’s ignition of his father’s lightsaber showed us just what one of these things could do, it was not the first lightsaber we had seen in the film. That distinction, belonged to Darth Vader. Unknowingly, this was our first glimpse of a lightsaber. As Vader surveys the dead bodies on the floor of the Tantive IV, we got a fleeting glimpse of something hanging from his belt. It was only after Obi-Wan Kenobi encountered Vader on the Death Star, did we finally realize that Vader had his own lightsaber (one that many of us assumed he used to ‘hunt down and destroy the Jedi Knights’ with). Vader has the flashiest blade interior of them all. Vader’s saber is layered with more black pieces than Luke or Obi-Wan’s sabers, which helps to blend into his all-black wardrobe. I really love the inner circle of rings inside the hilt. Almost looks like Luke’s, but not quite. In a way, the Emperor’s words in Return of the Jedi that Luke’s lightsaber was “much like his father’s,” could almost be applied when comparing Luke’s inherited saber and Vader’s. 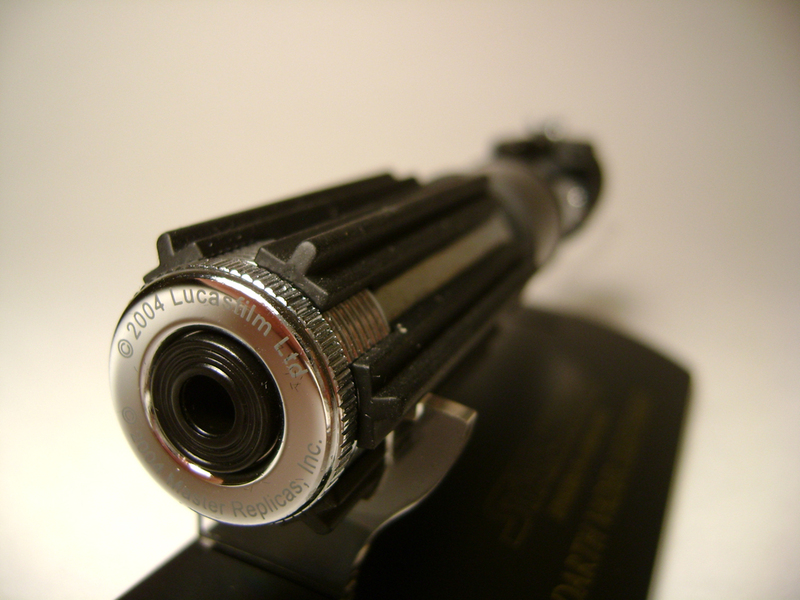 Like Luke’s, Vader’s lightsaber also uses a flash-attachment, but one developed by a company called Micro Precision Products. 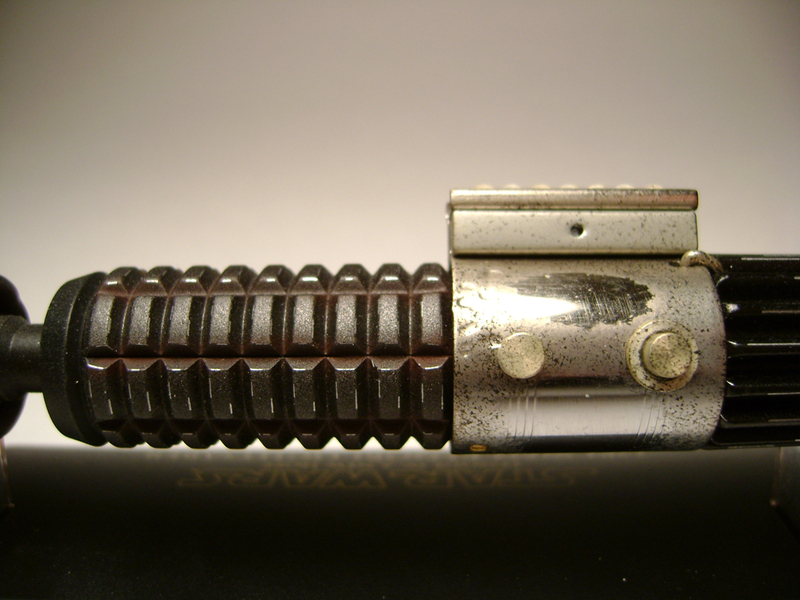 This is most evident when you see the grooves in the saber above, as well as the lettered-markings. Also of interest, is that Vader’s ignition switch only has 6 beads. Just add some windshield wiper blades, and voila! Aside from just a few pieces, Vader’s lightsaber is almost completely based on the MPP flash attachment. 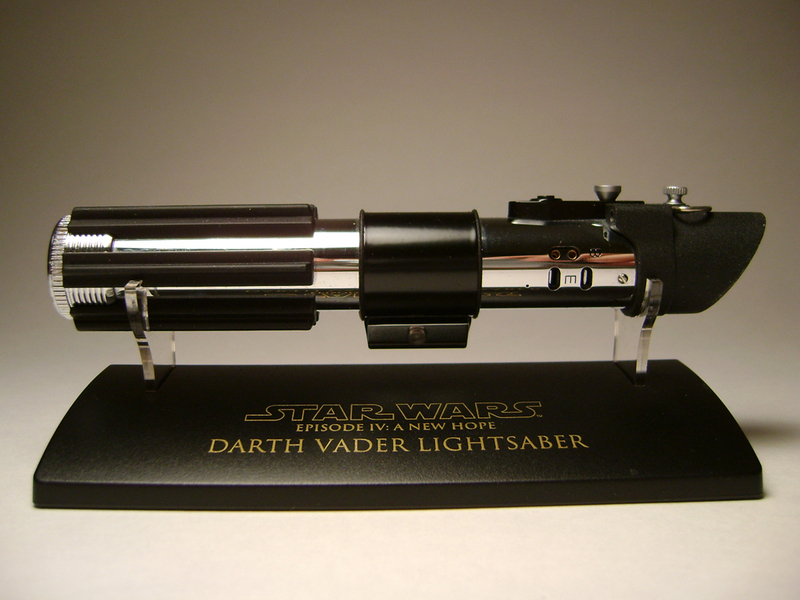 Vader’s lightsaber was part of the first year releases of .45-scale lightsabers in 2004, and included in Master Replicas’ Sith Collection, along with sabers for Darth Maul, and Darth Tyrannus. 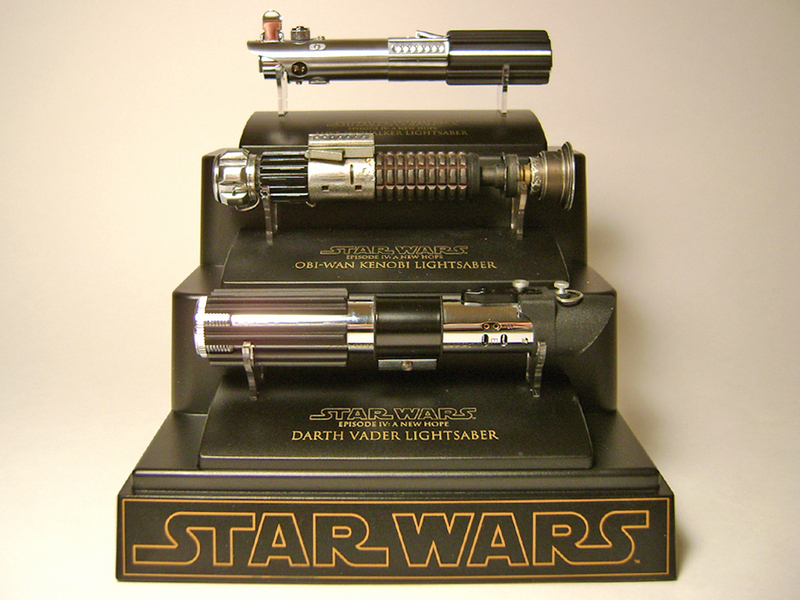 Want to display your lightsabers? Master Replicas has you covered! Originally, I was unsure just how to display my scaled replicas. And then, Master Replicas solved that problem for me! When I found out about this display stand from Master Replicas, it seemed just perfect! 3 levels, A New Hope had 3 lightsabers: it was meant to be! Speaking of display stands, the ones that come with the lightsabers have specific pegs, so the plastic holder pieces can only be set up one way. This explains why I was unable to make them all line up facing one direction. If adventure has a name, it’s Vic Armstrong. I can already hear most of you thinking, “who is Vic Armstrong?” In truth, you know Vic. You’ve seen him probably a couple times in your life, but never realized it. That’s because Vic is a stuntman, and probably one of the most famous in the world. He’s doubled the likes of Christopher Reeve, Sean Connery, and Harrison Ford. He’s also helped shape and plan some of the action-set pieces in films such as Die Another Day, War of the Worlds, and this summer’s The Amazing Spider-Man. It seems that adventure was set in Vic from the time he was a lad, as his family went from place-to-place before settling down. His father Bob Armstrong also honed in him a love and interest in horses, as the family would often train, race, buy, and sell them (his father also worked with the British Olympics horse-racing team). These skills and the discipline he learned would definitely help shape Vic’s life, as his dream of being a steeplechase jockey ended up being re-directed to the world of stunts. Vic’s autobiography mainly chronicles his own life and thoughts, as well as the adventures he has been on for well over half a century. He truly has lived an amazing life, reading how his work has taken him all over the world…even if he has come out of it with some broken bones, a bruised lung, and more. It’s also noteworthy that he takes time in his chapters to tell about other stunt persons he has worked with, mentioning many of them by name. While the cover of the book shows Vic doubling Harrison Ford in Indiana Jones and the Temple of Doom (a film Vic ended up saving when Harrison had to have back surgery), he does not shy away from also talking about some of the smaller films he did, or even those that he did and were never finished. To him, some of those hold fond memories, or experiences that would help him down the line when a solution was needed. Even though stuntmen are known for doing grueling and sometimes dangerous things, there’s something admirable about Vic, in that while some of the stuntwork is dangerous, he knows when limits must be set. An interesting story comes when a director wants to a have a character do a 350 foot fall from a railway trestle into a river, without the camera cutting away. Vic keeps telling the director that everything from added padding to putting a helmet on the stuntperson (the director’s idea) will not escape the fact that the stunt will end up taking the person’s life. The book shows a subtle evolution as Vic matures, soon getting into the stunt co-ordinating business, and then moving into the director’s chair on a few occasions (mainly second-unit footage). Much like some filmmakers have a select few crew members that are close to them because of their skills and reliability, Vic had much of the same, including a couple technical whizzes that could help him churn out needed hardware or apparatuses to get plenty of the jobs done. While the book is filled with little blurbs from some directors and stars whom Vic assisted/helped (like Lord Richard Attenborough, Kenneth Branagh, and Arnold Schwarzenegger to name a few), it really is Vic’s story, and it almost sounds at times like he’s doing his own rendition of Big Fish. In one instance, when a film titled The Message (about the prophet Mohammad, though he is never shown in the film) was shut down by several countries due feelings about the film’s content, the film crew ended up being allowed by Moammar Gadaffi to complete the film in Libya! That’s just one of the instances where it seems so unbelievable what Vic has done, where he went, or who else he has met. Even in reading his writing, you can’t help but feel that he would be a really nice guy if you met him in person. He can be rough around the edges in some instances, but that’s mainly him trying to make something good, but also thinking of the risks involved. Like some celebrities, Vic chooses to keep discussion of his family out of the picture, except in small doses, and later on in life when several of his own children end up joining him on his adventures. You almost wish to know a little more from them how they feel being part of the newer generation of stunt-people, in a world where many dangerous stunts are handled nowadays by computer-generated doubles. Due to all that he has done, the chapters in the book can vary: sometimes only a few pages long, with the longest stretching out almost 10 pages. It can get a bit disorienting with the number of people that Vic names. Luckily for me, I was reading my copy on my Kindle app, and was able to search through previous pages regarding various people or scenarios that Vic would reference. This might not be so cumbersome for those with steel-plated memory banks in their noggins. 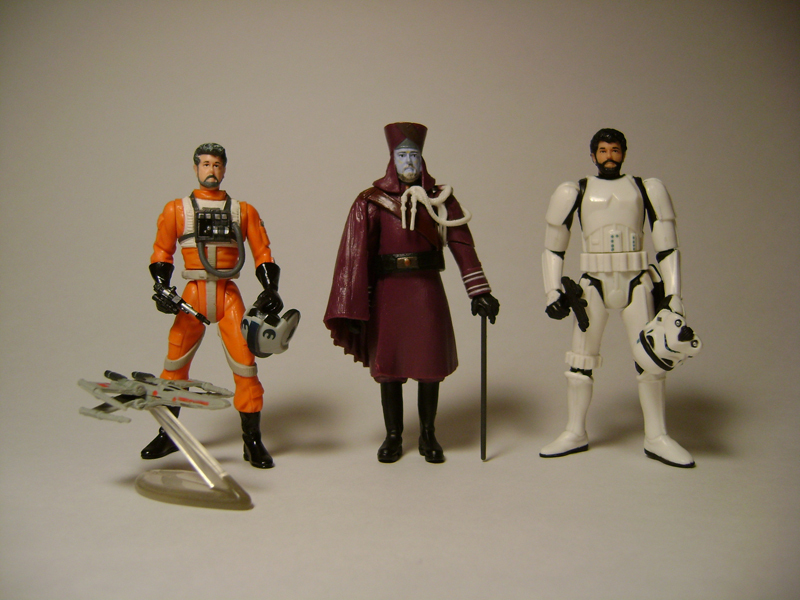 With the reappearance of Star Wars figures in the toy aisles in the mid 1990’s, we saw the return of many familiar faces, and the introduction of new ones. Of course, the mid-90’s also brought about the reemergence of the name George Lucas into the mainstream’s consciousness. After the Star Wars trilogy returned to theaters in 1997 as part of a Special Edition release, many of us were eagerly looking ahead to what would become the Star Wars prequels. New worlds, new characters, new vehicles…the sky was the limit. 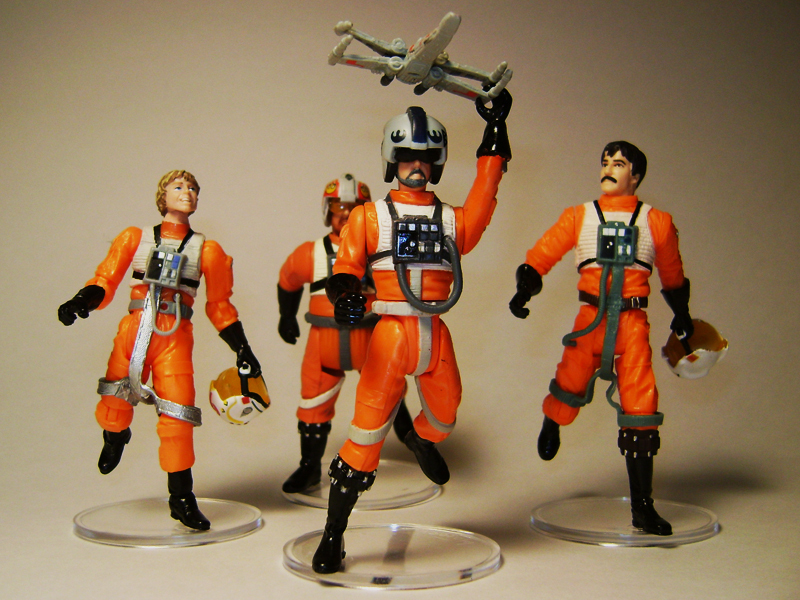 Of course, Lucas had a hand in the merchandising empire associated with his space opera, but the direction Kenner/Hasbro would take with the action figure line would soon venture into new territory. 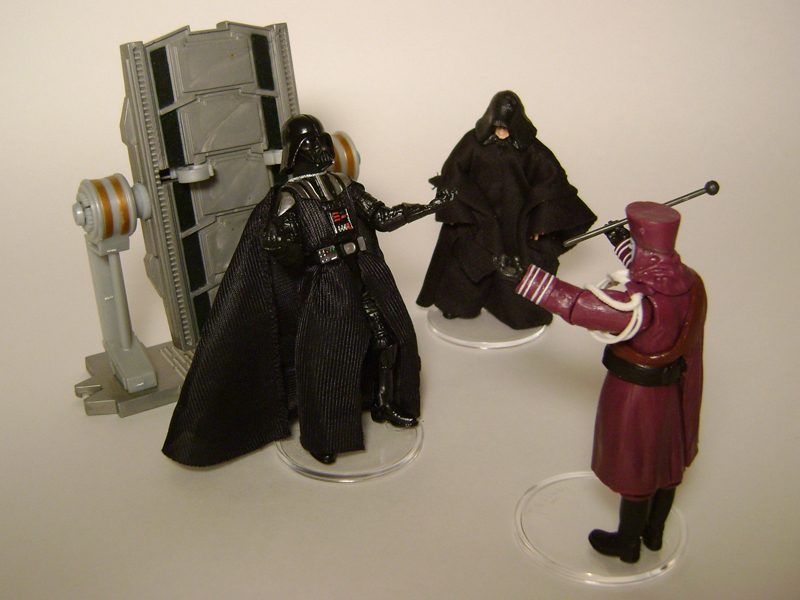 In May of 2002, the plastic world of Star Wars figures was shaken up in a big way when Star Wars: Celebration II hit Indianapolis, Indiana. 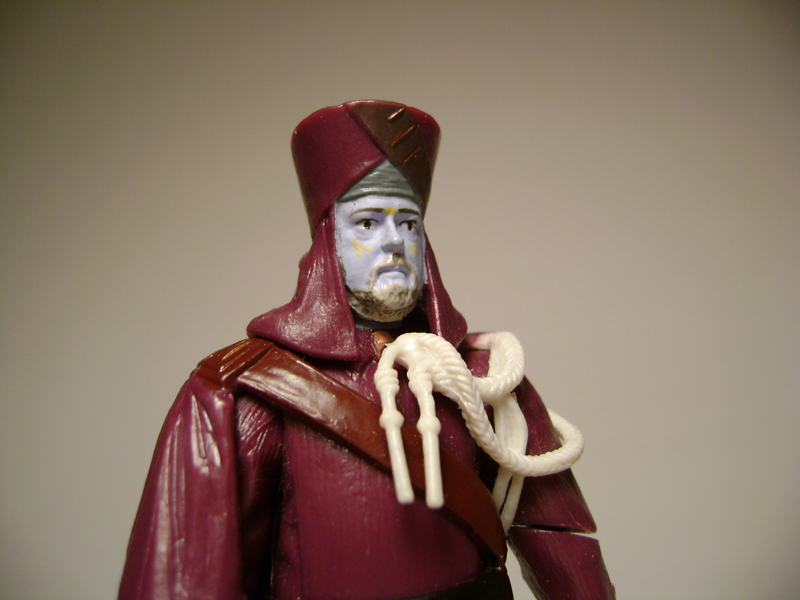 While the previous Celebration in Denver, Colorado had commemorative items like T-shirts, Celebration II was the first official Star Wars convention to have an exclusive figure. Celebration II coincided not only with the impending release of Attack of the Clones, but also the 25th anniversary of the release of Star Wars in 1977. Naturally, this was cause for much celebration. Among X-Wing pilots, Commander Jorg Sacul is renowned for his inner strength, his ability to remain calm under fire, and his mentoring of younger Squadron members. Once a reckless dreamer, his life changed course after a near fatal crash in his T-16 Skyhopper on his homeworld of Tatooine. He went off to the Academy and emerged as the top pilot in his class and a natural leader. A visionary storyteller, he entertains the pilots in his command with far-flung tales of distant galaxies thousands of years before the Republic. Rumored to be Force sensitive, many say Sacul would have become a great Jedi…if only he had been born in a different time. Of course, we know who Mr Sacul is supposed to be. Name-games are common with other members of the crew who have worked on the Star Wars films. For example, Jedi Coleman Trebor’s name is a slight alteration of Prequel Animation Supervisor, Rob Coleman. Jorg’s biography has some items pulled directly from Lucas’ own life, such as a near-fatal crash that ended up being a life-altering experience. 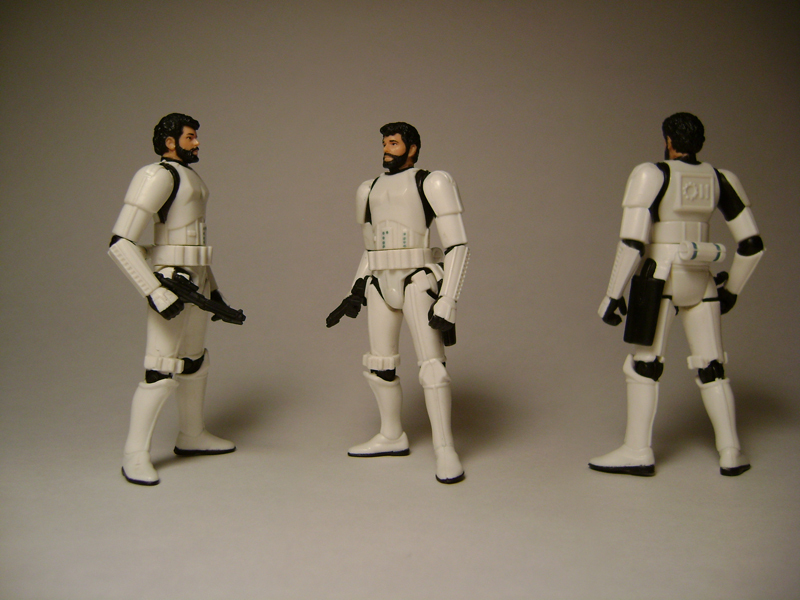 One of the big selling points of the Star Wars Saga and the Attack of the Clones line in 2002, was the use of Gentle Giant Studios‘ 3-D scanning technology to take digital scans of objects or people’s faces, heightening the accuracy of them in toy-form. 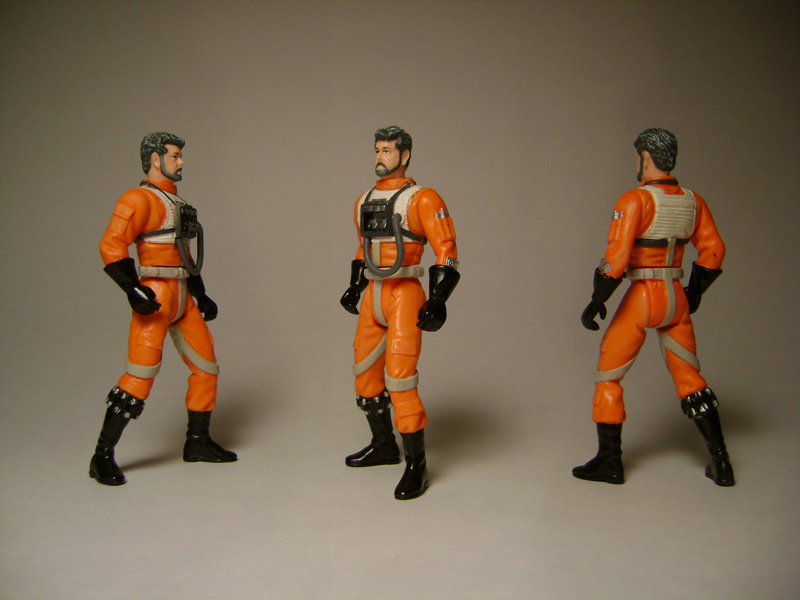 Though Jorg’s head is actually based on a scan that was made of Lucas’, it is the only newly-casted piece for the figure, with the rebel pilot body, helmet, and gun taken from other figure sources (the miniature X-Wing fighter is taken from the Star Wars/Micro Machines line). The likeness is ok, but the head looks a bit too ‘shrunken.’ As well, the paint application around his eyes makes them look smaller than they should be. After his appearance as a convention-exclusive, George would lay low for 4 years, only to return for a double-dose of exclusivity in 2006. This influential Wroonian guild baron has earned fame throughout the Republic for his vastly popular holodramas. He is also rumored to have an information network that rivals the Bothans. For those wondering just where Baron Papanoida is in Revenge of the Sith, he’s chatting with another blue-skinned Wroonian at the Coruscant Opera House (actually, George’s daughter, Katie). They can be glimpsed briefly as Anakin Skywalker rushes through the halls to find Supreme Chancellor Palpatine. 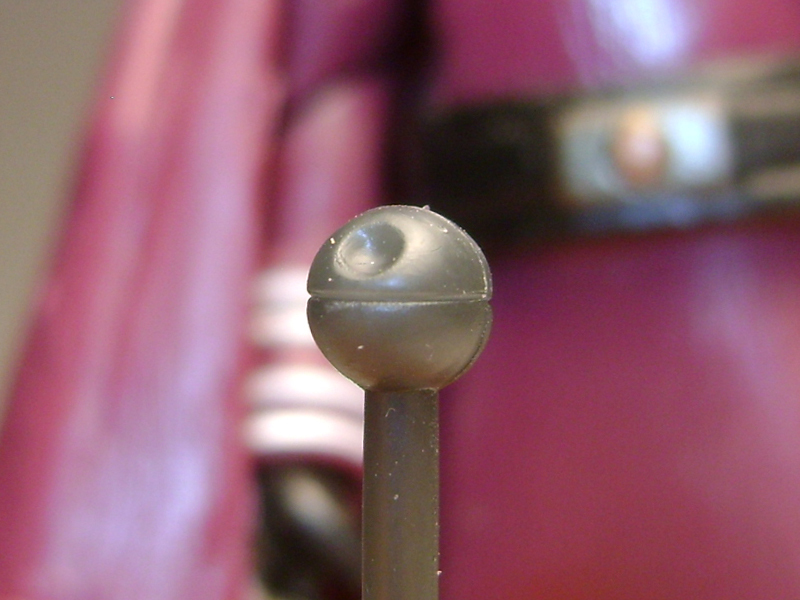 There is a fun little ‘easter egg’ that was added to the Baron’s figure, and it has to do with the tip of his cane. A small little indent, and a horizontal ring around the main sphere, makes the tip resemble the Death Star, which has led some to wonder, if the guild baron may have had some hand in its creation. Unlike Jorg Sacul, the entire sculpt of Papanoida is entirely new. Though it is a nice sculpt (and the detail on Papanoida’s face is much better), the figure suffers as being more of a ‘statue.’ The Baron can’t bend at the knees, and has swivel-joints in his elbow to give him some extra movement. It also is quite a chore just to get his cane to stay put in his hand. Of course, the Expanded Universe of Star Wars often gives minor characters another chance to shine. 5 years later, in October 2010, Papanoida would appear in an episode of the Clone Wars television series (though not voiced by George Lucas). Here, we get a behind-the-scenes glimpse of Papanoida working on a crucial scene for his latest holodrama. The Baron knows that big reactions are always a great way to involve his universal audiences. While the last two iterations had depicted Lucas as he appeared in the early 2000’s, his next appearance would take us back in time. 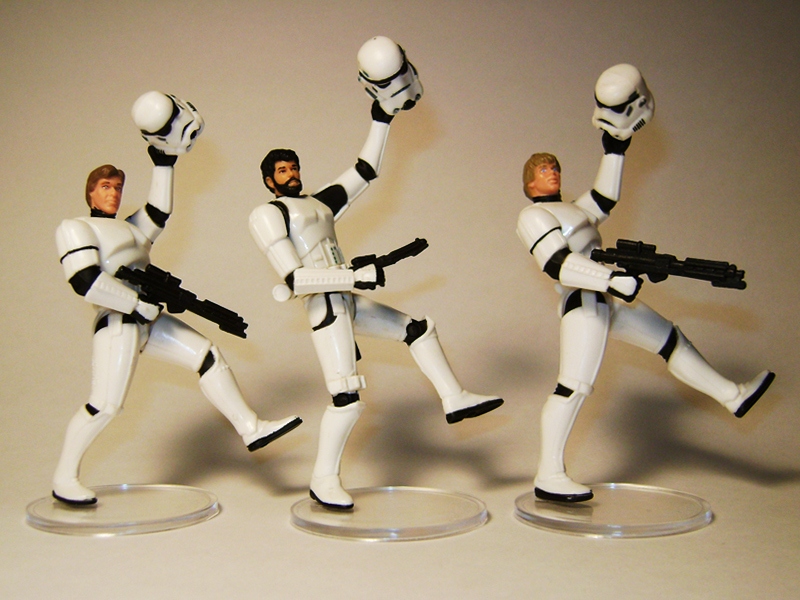 As part of the 2006 Vintage Saga Collection promotion, those who collected all 5 of the released figures, could send away 5 proof-of-purchases (along with $4.95 for shipping & handling), and receive a specially-carded figure of George Lucas (in Stormtrooper Disguise). 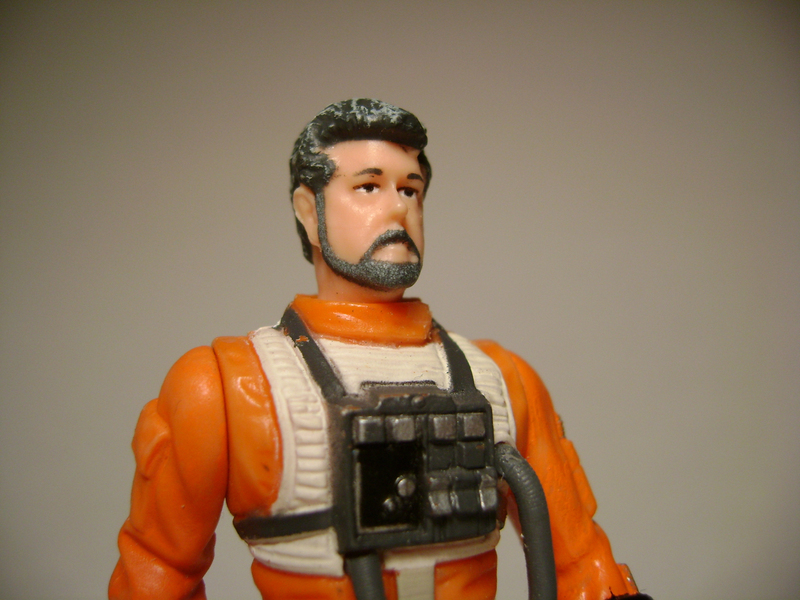 However, this figure’s facial appearance is that of George in the 1970’s, when he was working on American Graffiti, and Star Wars. Celebrate the legendary Star Wars films that changed the universe forever, with The Saga Collection. This collection brings to life the incredible story of good versus evil that captured our imagination and transported us to a galaxy far, far away. To commemorate these landmark films, we are honoring their creator, George Lucas. We pay homage to both his remarkable accomplishments in film as well as the legions of Star Wars fans that he inspired by presenting a likeness of the director himself, clad in one of the saga’s most iconic designs — the distinctive armor of an Imperial stormtrooper. May the Force be with you! The sculpting on this Lucas figure is slightly better than Baron Papanoida, and has a much better likeness than Jorg Sacul (who looked like his head got squeezed in a vice). He is also the first Lucas figure to sport jointed ankles. Strange enough, the oddity in the sculpt comes from how the head attaches to the Stormtrooper body. The head is on a vertical pivot, and a horizontal rotation piece under the neck. So, if you were planning to detach the head and place it on a different body, you’re out of luck. …take it away, Harrison, George, and Mark! 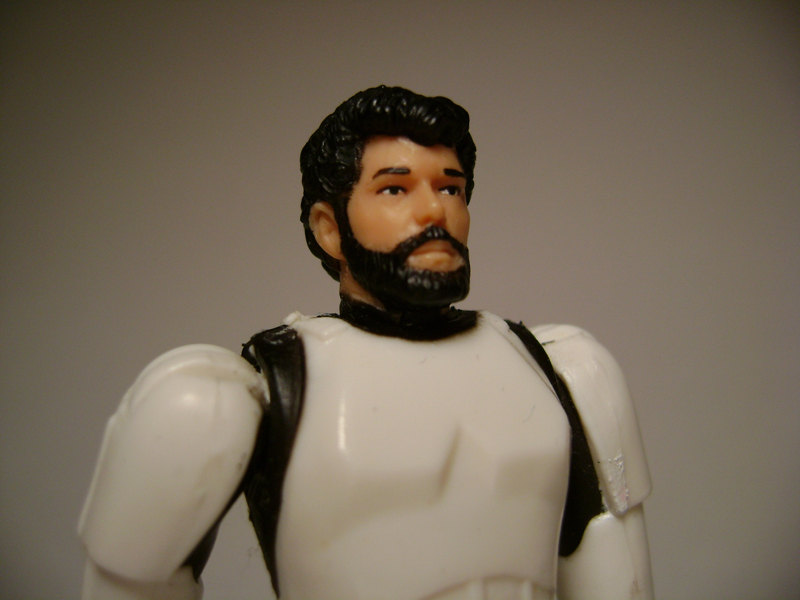 *Special thanks to Antonio Capello for helping me obtain the George Lucas (in Stormtrooper Disguise) figure. When one mentions Jaws, the first image that comes to mind for alot of people, is a giant shark. When Fuse Powered Inc released their Jaws app for the iPod/iPhone and iPad previously, it focused moreso on the human element of the first film, where you attempted to save beachgoers, and take down the giant shark terrorizing the citizens and tourists of Amity Island. Naturally, when it’s man-vs-shark, the game can’t end there. That brings us to Jaws Revenge. Sure, there’s a few of us who want to be the good guy and rescue our fellow man, but what about those days where you’ve had a bad day at the office? Your brain is ready to throb right out through your ears, and that nervous tic has creeped back into your eye? You got to blow off some steam, so what do you do? Take on the role of the most famous Great White Shark in history, and start chowing down! Munch down in the depths, or spring into the air to take down birds or other yummy treats above the water line. That’s pretty much all you do in Jaws Revenge: chomp down on people, boats (including The Orca! ), flying craft, and even belly-flop across decks and aircraft carriers, gobbling down humans like you were at a buffet line. Along with the familiar Amity Island locale, you can also unlock 3 other levels as you upgrade your shark. While the other two locales are in modern times, the fourth one puts you in the time of pirates, zeppelins, and primitive flying machines. Jaws Revenge also gives you a choice to play various levels to earn shark tooth coins to upgrade your shark. Along with these levels, you can also ‘free swim,’ earning extra coins, and collecting license plates. Once you collect them all, they will form a familiar message. Some of the license plates you can eat/collect. The shark that you see in these images are the bigger-n-badder version you get after you’ve completed the upgrade into a Mega Shark. Originally, your shark will be slightly smaller in size. However, this doesn’t mean one can’t have some fun. The more that you chomp down on things, you then start building up your ‘Frenzy’ meter. Once the meter maxes out and you activate ‘Frenzy Mode,’ the screen takes on a reddish-tint for a limited amount of time, and you gain a little more power and a greater leaping height. At this height, you can reach shark tooth coins high on the screen, and take out high-altitude aerial vehicles. Originally, I downloaded Jaws Revenge when the app Universal Movie Tycoon failed to function properly. I didn’t know that Fuse worked on both of these apps, but where Tycoon failed in my eyes, Revenge is all the more sweeter. 2) Watch trailers, take part in deals, or use social media to earn coins. This game strikes a very nice balance, where if you’re willing to drop down some money from your wallet, you can easily get your Mega Shark in a matter of seconds. However, if you’ve got plenty of time over 7 days or less, you can play plenty of levels and free-play rounds, and ‘earn’ your Mega Shark. When I experienced this in game form, I really wished that Tycoon could get this kind of earnings feature. This game’s ability to make me feel comfortable playing/earning more coins, easily allowed me to open up my wallet and buy a few things from the store. The good and the bad regarding gameplay for Revenge, is that once you’ve gone through all the levels, and collected all the license plates from the free play levels…that’s it. The game serves as little more than a stress reliever. Then again, that’s not a bad thing. Jaws Revenge isn’t the greatest game for the iPad or iPhone, but it’s a good game, and if you have no qualms about computerized sharks dismembering humans and animals, or bringing down airplanes and other man-made craft, you just might enjoy yourself. I know I did. We don’t think Chief Brody’s gonna make it home this time.